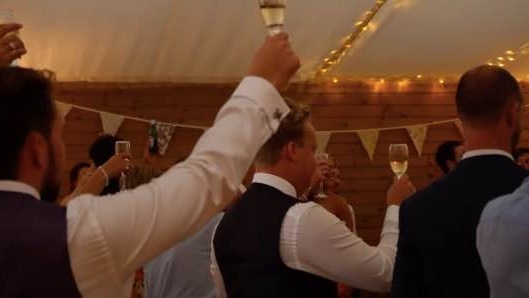 The Quantock Barn is available to hold your wedding reception. 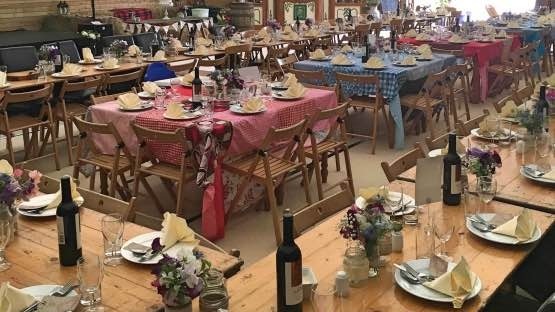 The Quantock Barn is a wooden clad barn, offering you a blank canvas which you can use to create your own perfect wedding reception. For a sit down reception it can easily accommodate 250 guests, it's square footage is 273m2, which is approximately 68 feet long and 52 feet wide. Attached to the Barn is a large kitchen with four cookers and plenty of space for food preparation, which is perfect for use by caterers. Exclusive use of Secret Valley from the day before your wedding until the day after. All accommodation can be booked out for the evening of your wedding. All guests can go back to their unique Glamping accommodation without the worry of driving anywhere. Our beautiful grounds, with stunning views of the rolling hills, trellis vineyard and picturesque lake. We only have weddings in these months. In the peaceful countryside setting, situated within your own field, you can enjoy your wedding reception. Although we do not supply the Marquee ourselves we have available a large paddock which is suitable for erecting a Marquee. The Primrose paddock is approximately the same size as a football pitch and it has a stoned car park in addition to the main car park. An alternative to a Marquee is a large Tipi to hold your wedding reception. The large Tipi is the size of a marquee but with more rustic glamour. It is something a bit different but still able to incorporate enough room to hold a sit down meal, and a dance floor. Although we do have a toilet block on site, if hiring the Primrose Paddock toilet hire is required. The end of the event is midnight in the Paddock, please discuss further with us timings. The cost of the Paddock is £1300 (Mon-Friday) & £1800 (Saturday). We have a range of different accommodation, please look at the website for more details and current costs, but please note that all units have to be paid for the two nights and minimum occupancy rules apply. We recommend the Shepherds Hut for the bride and groom. All of the accommodation at Secret Valley has to be booked out to your wedding party. For all wedding receptions held on Saturday all accommodation has to be booked for two nights. Please fill in the enquiry form below to begin your dream wedding at Secret Valley.